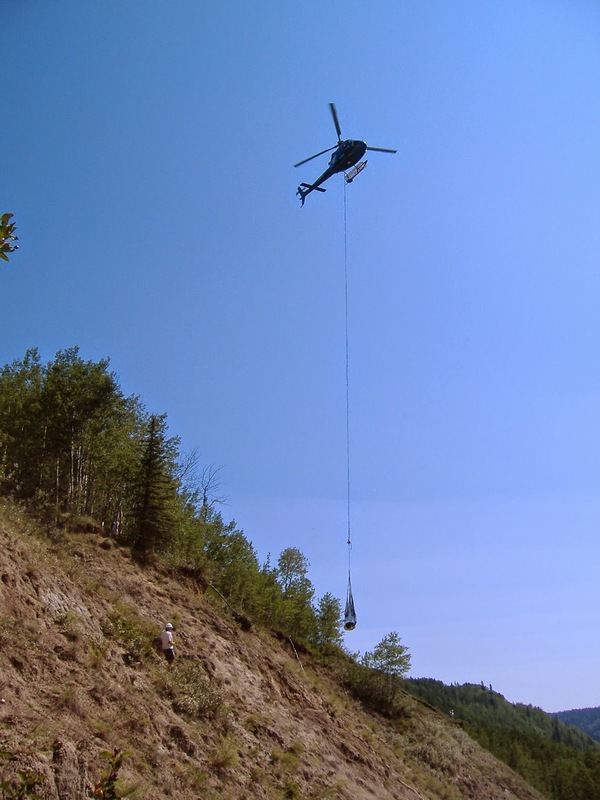 What’s up at Wapiti River? 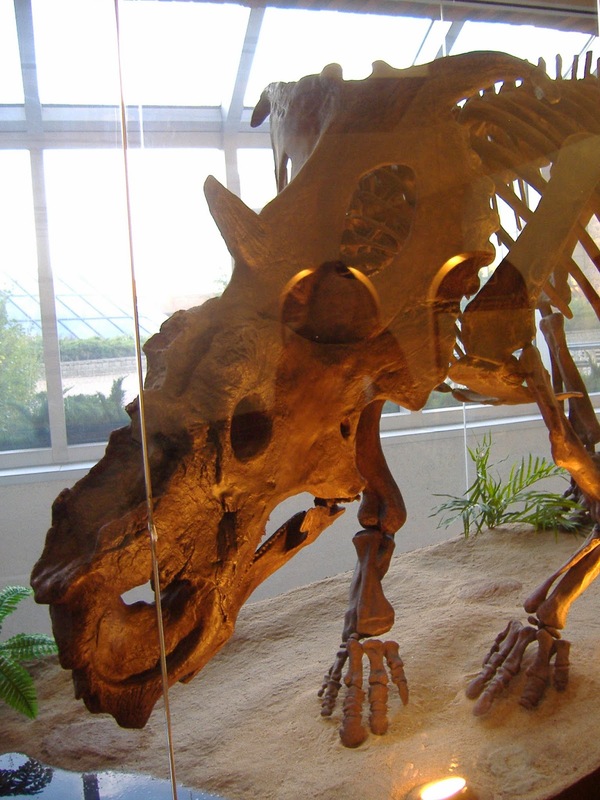 The world can always use some more Pachyrhinosaurus bonebeds. 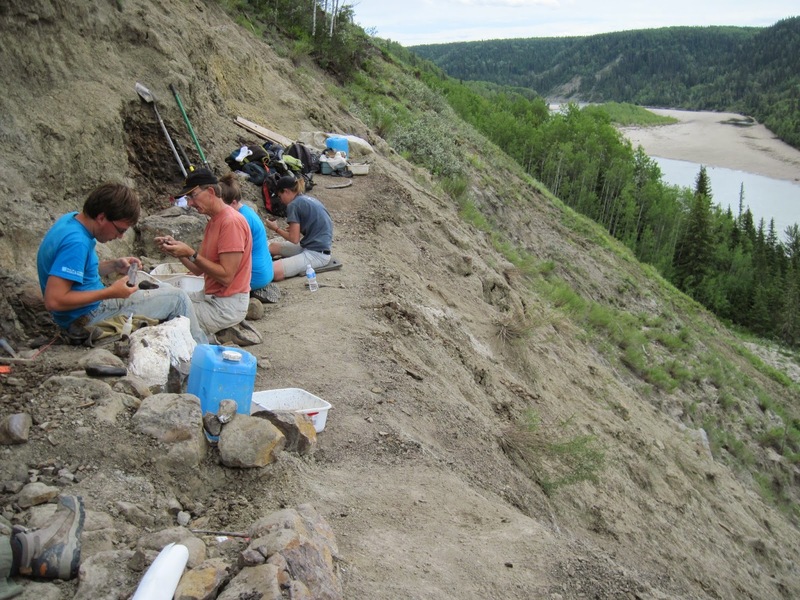 So hooray to my friends and colleagues Federico Fanti and Mike Burns, and my PhD supervisor Phil Currie, for publishing a description of the Wapiti River Pachyrhinosaurus bonebed (currently in ‘early view’ accepted manuscript form at the Canadian Journal of Earth Sciences). A friendly Pachyrhinosaurus lakustai greets students at Grande Prairie Regional College! 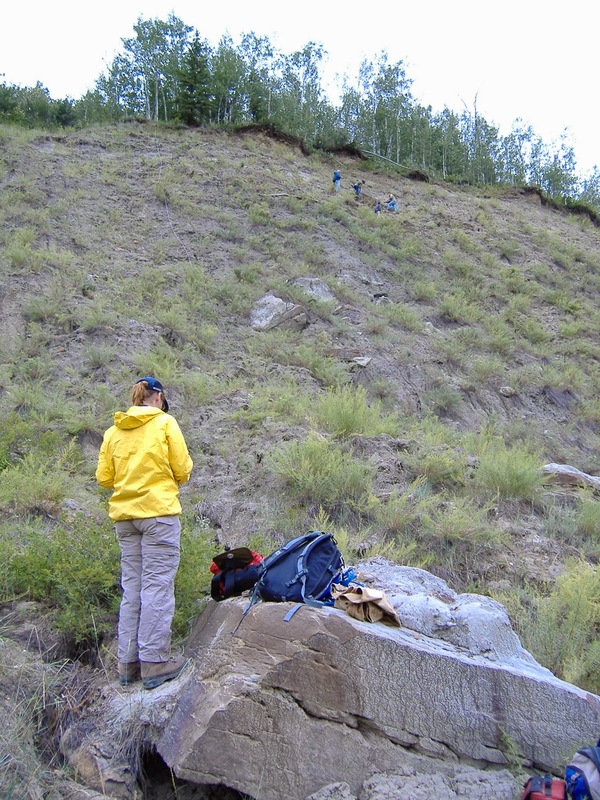 Most of the time, dinosaur palaeontologists look for bones in dry, barren landscapes – the badlands of Alberta, the Gobi Desert, etc – places that have lots of rocks and not much covering them up, like inconvenient forests or cities. But sometimes, you don’t have vast expanses of outcrop. In Nova Scotia, we dig up dinosaurs on the beach. 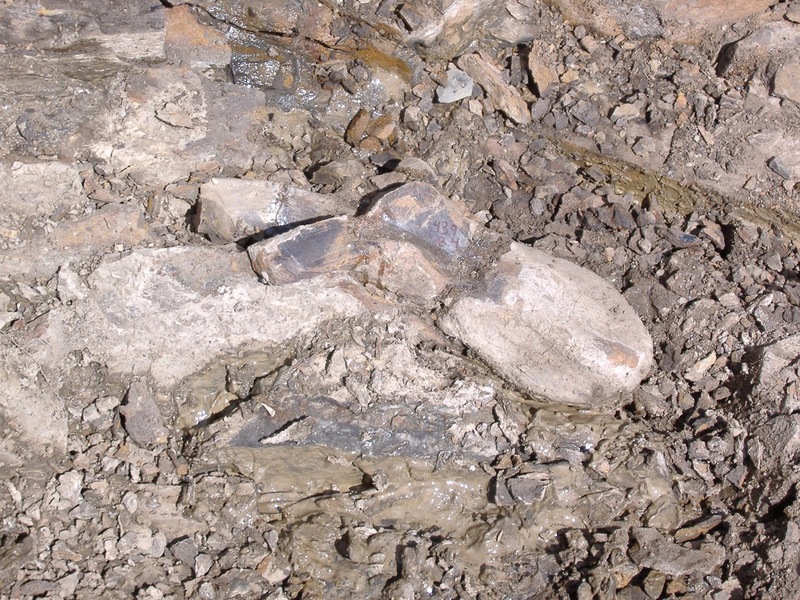 In the area around Grande Prairie, Alberta, you look for bones in the outcrops along rivers and streams. The very first summer I went out with the University of Alberta crew (way back in the halcyon days of 2007; the first Transformers movie was ‘good’, everybody read the last Harry Potter book overnight to avoid spoilers, and…apparently not much was happening in my musical spheres, but my, how time has flown), there wasn’t a Wapiti River bonebed. We knew that there were bones coming out of the riverbank somewhere, but it took the better part of a day to trace them up the hill to the bone layer. See if you can spot Phil for scale way up on the hill there, and remember that Phil is about 3x as tall as most humans. That’s where the bone layer is! It’s a pretty steep hill, and so those first few days excavating the bone layer meant hacking out little footholds and gradually making enough of a ledge for us to sit on and walk around each other without plummeting to our death. The last time I was there, in 2011, the ledge had expanded significantly, although you can see it’s still a pretty narrow slice! 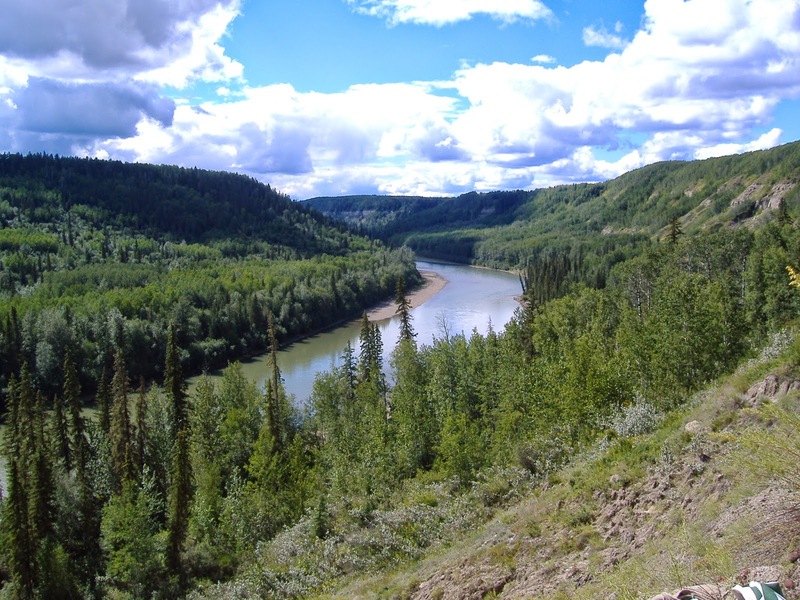 It’s a scenic place to work, with the river and boreal forest stretching away below; bear sightings were not uncommon (and occassionally closer than we’d all prefer), and I remember a hummingbird came down to check on us one day, buzzing around my head for a few moments! In this bonebed, there’s a layer of bones in a crazy, mixed-up layer of folded mudstones, and those are pretty easy to excavate. Here’s a dorsal vertebra. Nice and easy. But down beneath that, the skulls and larger bones are encased within super hard ironstones. We can’t really do much with these in the field, so we need to take them out in huge pieces. And here’s what the skulls look like. The circular depression down towards my left foot is the narial opening. The UALVP has like 15 of these suckers and they each take about 2 years to prepare with a crack hammer and chisel. 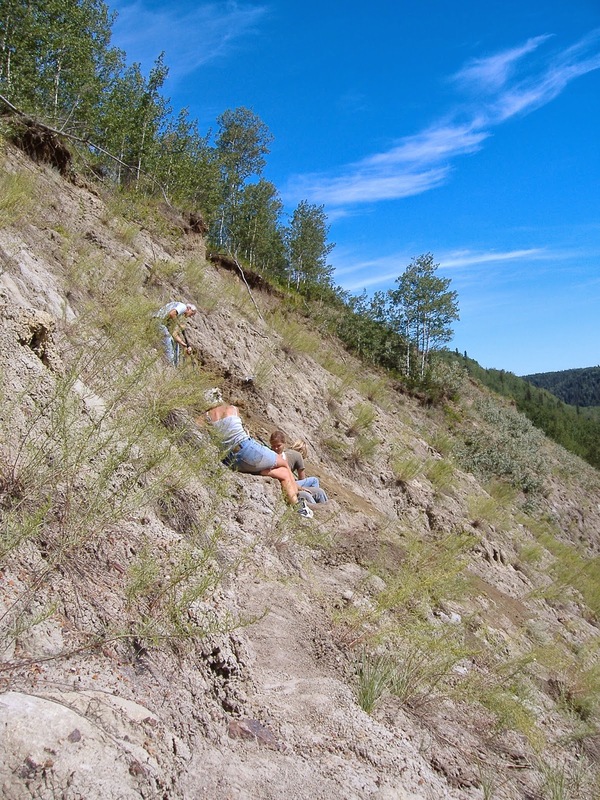 But the bonebed is also about halfway down into the river valley on a steep slope that’s hard enough to just haul yourself up, let alone a huge boulder. So we’ve been very lucky to have helicopter support to carry out some of the heaviest pieces at the end of each field season. Sometimes we were even visited by Aluk the Pachyrhinosaurus, mascot of the Arctic Winter Games in 2009! This was probably the strangest day in the field. There’s still much more work to be done on this bonebed – we still aren’t exactly sure what species of Pachyrhinosaurus is present. The age is right for P. canadensis, but only time will tell. 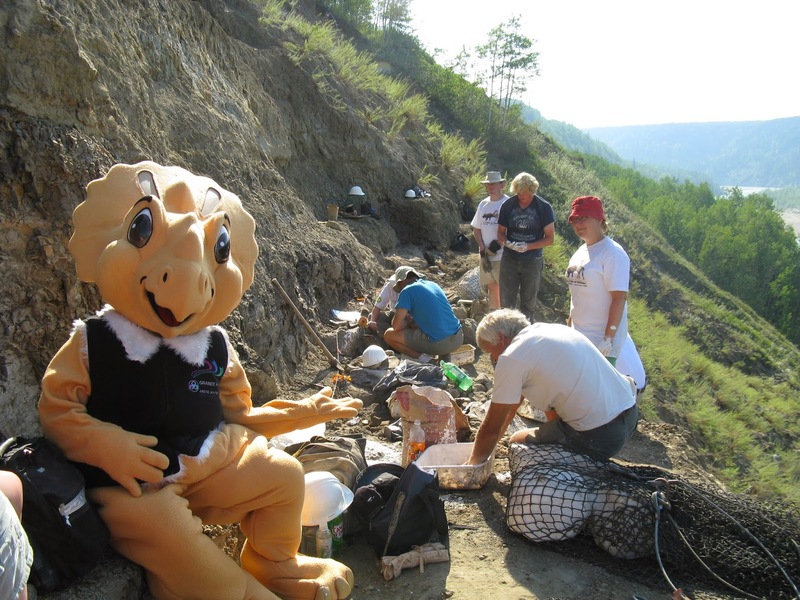 And with two Pachyrhinosaurus bonebeds in Grande Prairie – the Pipestone Creek bonebed with P. lakustai, and the slightly younger Wapiti River bonebed – there’s bound to be much more to learn about the evolution and biology of this unusual ceratopsian. Fanti F, Currie PJ, Burns ME. 2015. 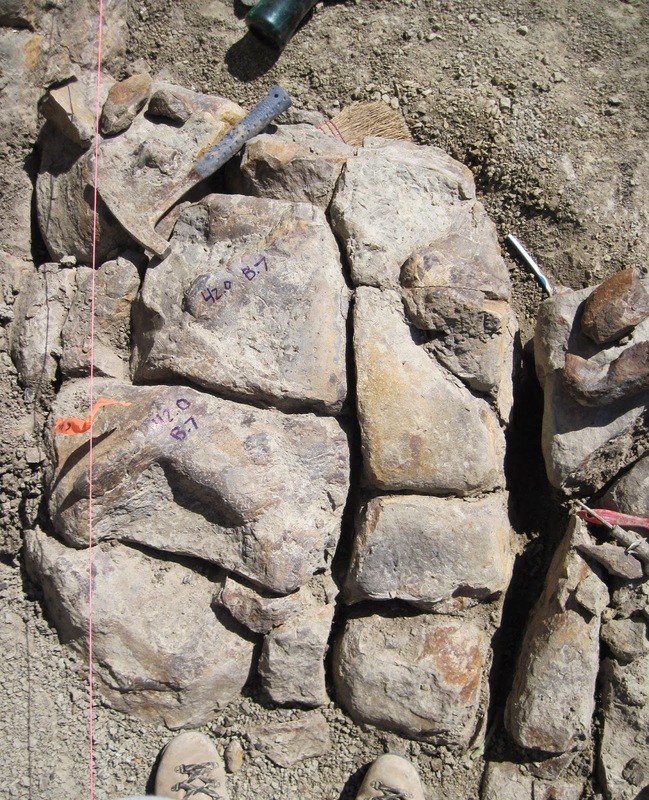 Taphonomy, age, and paleoecological implication of a new Pachyrhinosaurus (Dinosauria: Ceratopsidae) bonebed from the Upper Cretaceous (Campanian) Wapiti Formation of Alberta, Canada. Canadian Journal of Earth Sciences, early view. It’s #SciArt week on Twitter!